Are you ready to have a blast at Kings Island? Book one of our discounted Kings Island packages to save you money on your next vacation. From your Kings Island tickets to great area hotels and visits to other nearby attractions, aRes Travel will help you ensure your time in the Cincinnati area is a blast from start to finish! Kings Island is one of Ohio’s premier amusement parks, situated a short drive from Cincinnati’s city limits. As the second-most popular seasonal park in the entire country, you can rest assured that you’re going to have an incredible time! Step through the iconic entrance, featuring a mini Eiffel Tower, and marvel at the massive Royal Fountain at the heart of International Street. Take a ride on the vintage 1920s Grand Carousel. Then move on to the main attraction ― the roller coasters! Kings Island has some of the best coasters in the country. Are you brave enough to take the Flight of Fear? How about the Vortex, a mega-looping steel coaster that held a record for its six death-defying inversions? There’s also the Backlot Stunt Coaster, which will take you on a crazy car chase based on the 2003 film, The Italian Job. Dodge police cars, outrace helicopters, and blast into darkness as you make your escape! Kings Island has more than just coasters. Get lifted 137 feet into the air and reach top speeds of 76 miles per hour on Delirium, Kings Island’s giant frisbee ride! 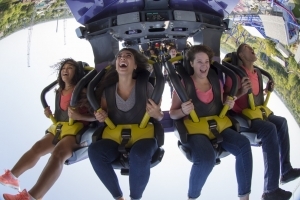 Experience maximum Gs on Drop Tower: Scream Zone, the tallest drop tower in the world! Step back in time and ride the classics, starting with the Monster. Then head to the Scrambler, Shake, Rattle, and Roll, and the Zephyr, a swing ride that will lift you 30 feet into the air! 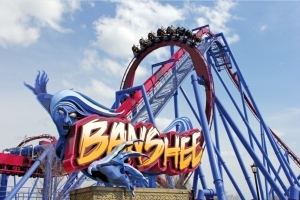 For exclusive deals on cheap Kings Island packages, including discounted park entry, amazing savings on hotels, and some of the lowest prices on travel, call 1 (800) 434-7894 (international callers use +1 (619) 546-5622) to speak with an aRes Travel planning expert seven days a week, or book online now.